Background: Cochlear implant is established as an effective and safe method of rehabilitation for profoundly deaf patients. There are two common surgical approaches for cochlear implantation. The first surgical approach, with mastoidectomy and posterior tympanotomy, is known as the classic approach or posterior tympanotomy approach. The second surgical approach, without mastoidectomy or posterior tympanotomy, is known as the suprameatal approach. Using the suprameatal approach, the active electrode is inserted and posterior tympanotomy. Aim of the work: To compare between suprameatal approach and posterior tympanotomy approach in cochlear implantation. 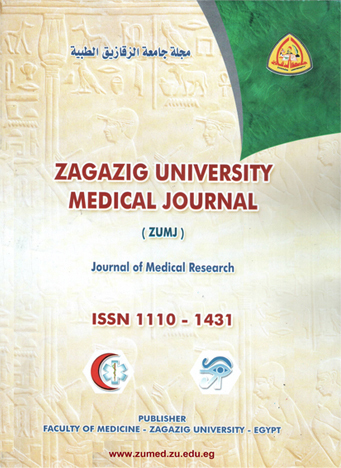 Patients and methods: This study was conducted on 30 patients that underwent cochlear implantation surgery in Zagazig University Hospital, in the period from October 2010 to April 2014. The patients were 19 males and 11 females, their age ranged from 2 to 7 years. Patients were divided to 2 groups: one group was implanted by the supra meatal approach (6 patients) and the other one was implanted by posterior tympanotomy approach (24 patients). Results: There was a significant difference between the 2 groups as regard the total duration of surgery in favor of 1st group A (SMA). There was no significant difference between the 2 groups as regard the total number of major or minor complications. But there was one case of facial nerve paralysis in a child implanted by the classic approach. Conclusion: SMA may be clearly a good alternative to the classical surgery technique for CI in terms of reducing the duration of surgery and reducing the incidence of facial and chorda tympani nerve injury.